Throw out all you learned from high school, college, and the trivia game at your local watering hole. 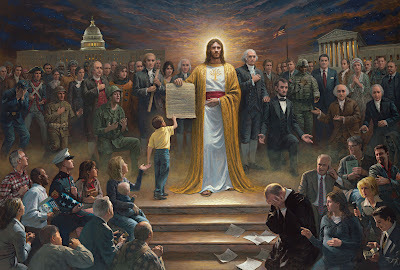 According to this moving painting, Jesus--NOT James Madison (or Rush Limbaugh)--wrote the document at the heart of the American experiment. So, I have a few questions for him. 1. Why would a perfect document need Amendments? 2. Why were some people only worth three-fifths of other people? Were they heathens? 3. Why so many commas in this sentence? It's just confusing: "A well regulated Militia, being necessary to the security of a free State, the right of the people to keep and bear Arms, shall not be infringed." 4. What did you have against alcohol in 1919? And what brand of vodka made you change your mind in 1933? 5. Are you American now? Does that mean we win by default no matter what? So the Mormons were right? Fear their powers of religious legerdemain. Hey look! JFK made the cut! If that's true, we're all a shoo in. Is that the symbol for Gondor on his chest? @Paul: Looks like it. One savior to rule them all. Always begin a long trip with...CAFFEINE!! Haiti: Do you know Jessical Badio? Is this what 40 looks like? Guess what I'm doing tonight?